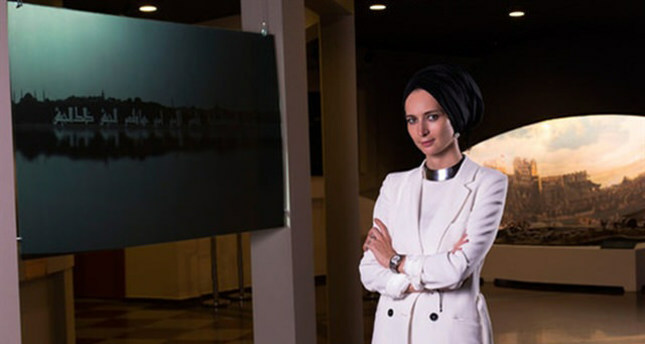 Contemporary art and traditional calligraphy mingle with each other in artist Fatma Zeynep Çilek's videoart work "Padişehir" currently on display at the 1453 Panorama Museum, the world's only full panoramic museum illustrating the conquest of Constantinople. Having already opened on Aug. 19, Çilek's work shows a silhouette of the historical peninsula written with the Prophet Muhammad's (Peace Be Upon Him) well-known hadith "Verily you shall conquer Constantinople. What a wonderful leader will he be, and what a wonderful army will that army be!" in the Kufic calligraphic style. The videoart's background was enriched with a call to prayer and the voice of seagulls. In a statement, she said, "My work explains the sense of belonging as well as how a civilization conquered a city and recreated it. Padişehir is an example of contemporary art focusing on Turkish culture." The Ankara-born artist is specialized in traditional ornamental art. In 2013, she worked for the Directorate of Ottoman Archives. Çilek currently continues her sculpture and painting projects at her workshop in Nişantaşı.